Liberal publications like the UK’s Guardian are depicting people who supported the Evans parents in the case of Baby Alfie as “fanatics” and “vultures”. It is clear who the target is – Christian groups who came out to support the family. But there are many non-Christians (like me, for instance) and non-practicing Christians who have supported the family. People around the world are concerned at the power the State seems to have acquired in making decisions about the health and treatment of ourselves and our loved ones. We are especially concerned about the power to supersede parents in decisions over their children. And we are angered by the callousness of a judicial system that refused to allow the baby to be taken to Italy which offered treatment and care at no cost to anyone. We are also concerned that the hospital may be covering up misdiagnosis or other mistakes in the treatment of the baby. These are questions in which the whole world has a stake because powerful Western countries like the United Kingdom de facto set the policies and practices for doctors and hospitals worldwide. Britain’s public health system is held out as a standard for all countries to follow. In this context it is important for all of us everywhere to ask whether the hospital was mistaken in its assessment of the baby, what were the systemic problems and dynamics that led to the breakdown of trust between the family and the hospital, and how things culminated in the bizarre spectacle of judges actually stopping parents from taking their own baby for treatment to another country. These are too important questions of public interest to be overshadowed by the antagonism between ideological liberals and Christian conservatives. 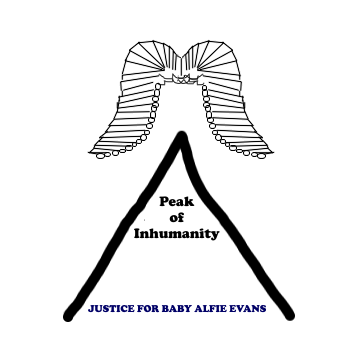 Let us look at the claim about Christians “manipulating” the case of Baby Alfie Evans. A very ordinary family was in trouble and Christians and Christian groups reached out. What is wrong with that? Is it illegal to offer to help someone in distress with legal counsel? So what if the Christian groups were motivated by their pro-life ideology? What other than ideology motivates those who are supporting the doctors and judges in this case? What other than ideology drives liberals writing op-eds in the Guardian to concur with a course of action that would deny a little baby alternate treatment at a hospital in another country at no cost to anyone? Christian groups have as much right to act on the belief and values they hold dear as do liberals or atheists or people of any other persuasion. I am not diminishing the importance of the ideological dispute between those who claim the sanctity of life in all situations regardless of the quality of life and those who would delegate life and death decisions to hospital policy and doctor’s judgments. But liberals have to step back from their philosophical preoccupations and take a breath. The Evans’ family has been protesting the treatment of their son for months before any Christian groups got involved. People all over the world have been complaining about medical kidnap -big hospitals forcing their decisions on patients and their families. Parents all over the world have been saying for years that the social services and welfare authorities are systemically undermining their authority over their children, even when they, the parents, are acting in the children’s best interest. These are the people protesting the State action in Alfie’s case. Something is going very wrong today in the way in which the welfare State is interacting with families over children. The agendas of big hospitals, cutting edge scientific research and Big Pharma are often inimical to the health and welfare of ordinary people. Liberals have to face the fact that some of their pet doctrines and big state projects have proven to be mistaken, or atleast need a thorough rethink. They need to open their minds – something they keep telling Christians to do. The Big State and corporatized or socialised medicine have achieved a lot, but in their very largeness sometimes the human side of things is lost. The most obvious ways are the corruption and ruthless commercial interests that come with the vast sums of money involved in these enterprises. But what is even more important to understand is that as their powers extend deeper and deeper into our homes, families and everyday lives, we are increasingly beginning to feel the edge of this loss of the human, individual side of things. Christian doctrine throws the light on what we have all lost to science and the ethics of the welfare state. Is this a price we have to pay for the greater good health and comforts we all enjoy in the modern world? That is the question. But it cannot be answered if liberals refuse to enter the debate just because there are Christians on the other side. Suranya Aiyar is a lawyer and mother of two from New Delhi, India. She runs www.saveyourchildren.in.